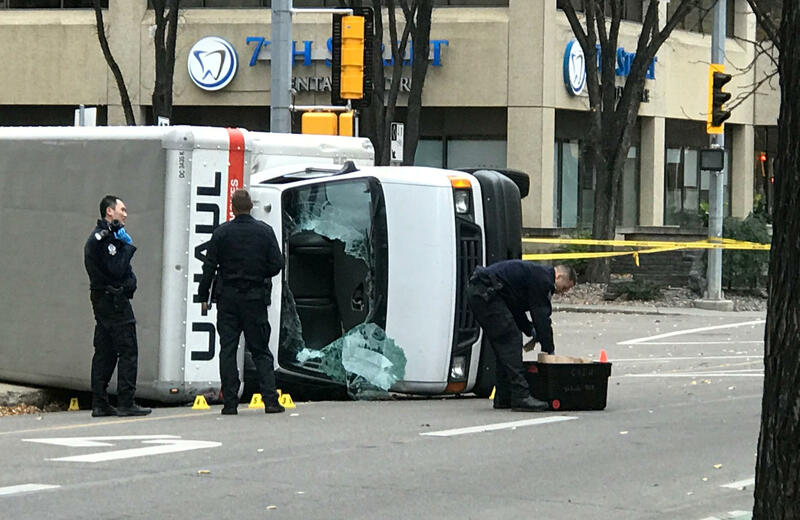 EDMONTON, Alberta -- A car and knife attack on a police officer outside a football game and a high-speed chase of a moving van that left four people injured are being investigated as acts of terrorism, Canadian authorities said Sunday. Edmonton Police Chief Rod Knecht said officers took the suspect, later described as a 30-year-old Edmonton man, into custody and he is believed to have acted alone. Knecht said an Islamic State of Iraq and Syria (ISIS) flag was found in the car that hit the officer, and Canadian Prime Minister Justin Trudeau called it a terror attack. The attack began outside a Canadian Football League game at Commonwealth Stadium in the western city of Edmonton on Saturday night, when police say a white Chevrolet Malibu rammed a traffic control barricade and sent an officer flying 15 feet into the air. Knecht said the driver then got out and attacked the officer with a knife before fleeing on foot. The officer was taken to a hospital and treated for non-life-threatening injuries while a manhunt was launched. "It's not critical," Knecht said of the officer's condition. "It is believed at this time that these two incidents are related," Knecht said. "It was determined that these incidents are being investigated as acts of terrorism." Knecht said Edmonton police are working with the Royal Canadian Mounted Police's National Security Enforcement Team and other Canadian security agencies. He advised the public to remain vigilant and observant of their surroundings. It was military appreciation night at the football game between the Edmonton Eskimos and the Winnipeg Blue Bombers. Canada's chief of defense staff, Gen. Jonathan Vance, conducted the pregame coin flip at Commonwealth Stadium and two CF-18 fighter jets did a fly-past before kickoff. More than 800 Boy Scouts were expected at the game. Canadian Prime Minister Justin Trudeau said in a statement that Canadians "stand with the people of Edmonton after the terrorist attack on Saturday that sent an Edmonton Police Service officer to hospital and injured a number of innocent people who were out to cheer on their football team and to enjoy an evening in their city." "We cannot -- and will not -- let violent extremism take root in our communities. We know that Canada's strength comes from our diversity, and we will not be cowed by those who seek to divide us or promote fear," Trudeau said. Canada's Public Safety Minister Ralph Goodale said on Twitter that the country "will not be intimidated by violence."